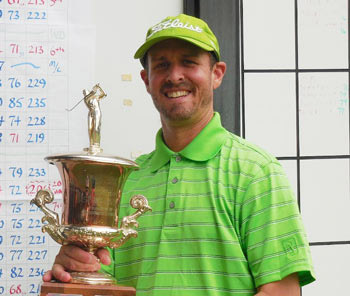 Three-time defending champion, Ryan Sloane, from Campbell, California, leading by 5 strokes to start the day, held off a strong charge by Juan Gonzalez of Antelope in a playoff to win his 4th consecutive championship. After chasing Sloane all day, Gonzalez finally caught him at the 17th hole when Sloane made an uncharacteristic bogey. They both parred 18 to finish the 54th hole each at 10 under par. Gonzalez, who tied the low round of the day with a 67, put his approach shot on the first playoff hole inside of Sloane and seemed to have the upper hand. Sloane, however, made up for his earlier bogey by rolling in a 35 foot birdie putt on the first playoff hole at Hole 17. Gonzalez had a chance to match Sloane’s birdie, but his sliding 12 footer missed by inches. Jeff Weiss of Roseville fired a 3 under 69 to take third at 7 under par.